Can this stylish noise-canceller take a piece out of Bose? Building a noise-cancelling headphone these days is like trying to be a great basketball player during Michael Jordan's heyday, or trying to win the U.S. Open during Tiger Woods' prime. The Bose QC-15 is simply amazing at eliminating environmental noise — and it sounds quite good, too. But Sony's trying hard to compete, first with the digital noise-cancelling, MDR-1RNC, and now with the MDR-10RNC. 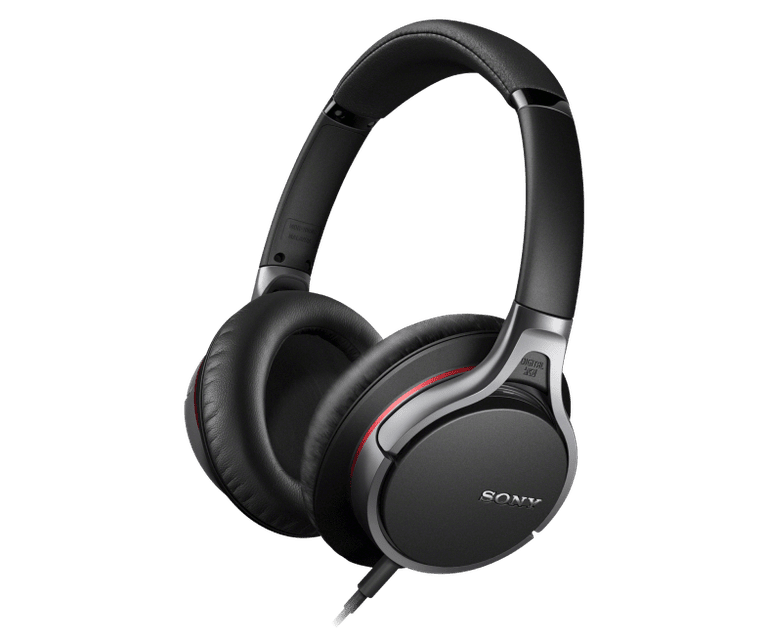 While the MDR-1RNC came closer than any other over-ear headphone to equaling the QC-15's noise-cancelling performance, its noise-cancelling mode lacks in comparison. The MDR-10RNC doesn't have the MDR-1RNC's fancy digital NC, but it does have its own adaptive NC. Push the AINC button when the noise cancelling is on, and the MDR-10RNC will listen to the surrounding noise and automatically optimize itself with one of three noise-cancelling modes: airplane, bus or office. Unfortunately, I didn't get a chance to fly with the MDR-10RNC, but I did get to take it on Los Angeles' Orange Line bus. I wore it for about two hours straight and found it quite comfortable. After the two hours, it did start to mash down on my rather large earlobes some, but pulling the headphone off, rubbing my ears a little, then replacing the headphone fixed it for a while. I didn't think the MDR-10RNC was as comfortable as the QC-15, but it's comfy enough for most plane rides. During my time on the Orange Line, I didn't notice anything particularly great about the MDR-10RNC's adaptive noise cancelling. It seemed to work fine, but not really any better than what I'm used to getting from average noise-cancelling headphones. The same held true when I used it in my home office. The noise cancelling worked quite acceptably, but couldn't approach the eerie "cone of silence" effect that the QC-15 delivers. Of course, with no switch to put the headphone firmly on one of the special NC modes, and no indicator for what mode was on, it was impossible to be sure I was in the optimum mode. So your mileage may vary. After my experience with the MDR-1RNC, I had a bit of trepidation the first time I plugged the MDR-10RNC into my iPod touch. Facing my fear, I put 'em on, flicked on the noise cancelling, hit the AINC button to optimize it, then got Led Zeppelin's "Dancing Days" playing. It was obvious that the MDR-10RNC, even though it looks a lot like the MDR-1RNC, is a substantially different headphone. Based on recent experience, I kind of expect Sonys to sound a little bass-heavy, but the MDR-10RNC's tonal balance sounded admirably even and natural. There wasn't a ton of bass, but there was enough for my taste. In fact, it reminded me a lot of one of my all-time-fave noise-cancelling headphones, AKG's K 490 NC on-ear. The lower treble seemed a little emphasized, which elevated Robert Plant's vocals and Jimmy Page's guitar in the mix and made them sound somewhat more lively. Is this a good thing? That depends on your taste. Personally, I'd have preferred just a tad less treble (which would have had the subjective effect of boosting the bass a bit), but I know a lot of headphone enthusiasts like a slightly treble-heavy sound. But then, "Dancing Days," like a lot of the Zep stuff, isn't really all that bass-heavy. So I switched to the heavy metal classic Electric, from The Cult. "King Contrary Man" has much more bottom-end kick than "Dancing Days," but I can't say it really got the MDR-10RNC rocking. But I can't say the MDR-10RNC sounded thin, either. It just sounded accurate. No, it's probably not the headphone you'd want for hip-hop, but for most listening material, it sounds quite nice. Switching over to lighter fare — "Brother Hubbard" from alto saxophonist Kenny Garrett's classic — the MDR-10RNC sounded even better, its somewhat lightweight bass not really mattering (or at least sounding appropriate for) jazz. But switch the NC off, and the same tune sounded very dull, obscuring the lively, somewhat Coltrane-ish character of Garrett's tone. "Dancing Days" turned into a boom-fest, with muffled mids and bloated bass that seemed to obscure much of what was going on in the mix. I'd use this mode only out of desperation if the AAA battery runs out and I don't have a spare. There are a lot of things I like about the MDR-10RNC. It's comfortable. It looks nice. In NC mode, it sounds quite good, at least for my taste and the music I listen to. Does it compete with the Bose QC-15? The MDR-10RNC is definitely more lively sounding, although the Bose has a fuller sound. The MDR-10RNC can still play music even when the battery runs out, while the QC-15 is totally useless when its battery dies. The MDR-10RNC looks cooler. However, the MDR-10RNC's noise cancelling is fairly average, while the QC-15's is truly exceptional.